Ivermectin remains active in dung for one month after falling to the field, affecting arthropods in their locomotor and sensory capabilities. A multidisciplinary research team, led by Jose R. Verdú, a researcher at the Ibero American Centre for Biodiversity (CIBIO) of the University of Alicante and made up of researchers from the Spanish universities of Alicante, Jaen and Granada, the French universities of Montpellier and Paul-Valéry Montpellier, National Museum of Natural Sciences-CSIC and IUCN-Centre for Mediterranean Cooperation, has analysed the effect of the drug Ivermectin on populations of Scarabaeus cicatricosus, dung beetle, a key in Mediterranean ecosystems. The work "Low doses of Ivermectin cause sensory and musculoskeletal disorders in dung beetles" was published in Scientific Reports. This research shows that arthropods ingesting this substance, even at low doses, lose their ability to interact with the environment affecting their locomotor and sensory capabilities, a fact that may explain the decline the populations of these species of beetles have suffered. Ivermectin is a very effective antiparasitic used preventively in cattle since its discovery in 1981. Since then, its use has grown exponentially to become a standard treatment against parasites, even in humans. Considered by the World Health Organization (WHO) as an essential medication, Verdu explains that although this drug has proven quite effective, it preventive use causes damage. The problem that researchers have found is that the Ivermectin molecule does not degrade when it comes out in the cattle dung. Residues remain active, at least one month from the time they fall in the field, which means they have the same lethal power to both arthropods and parasites. Thus, Verdú’s team remark on the negative effects to the environment, as beetle populations, diptera, etc, are decreasing. The result is adult arthropod beetles being significantly affected, both in their mobility and orientation, as well as in their reproductive capacity. This result contradicts what international veterinary manuals have said so far and can help us understand the decline in populations of these species that several researchers detected some time ago. In order to carry out this work, researchers have used electroantennography techniques, olfactometry and strength sensors for the first time to provide measures of the insects’ muscle power and sensory ability. 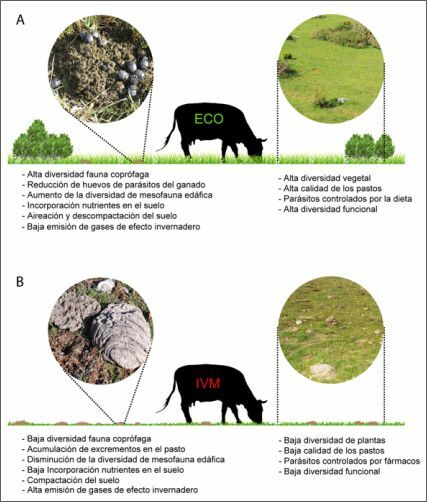 The study was conducted in the Doñana National Reserve, distinguishing between sites with Ivermectin and Ivermectin-free sites and detecting differential activity in the decomposition of dung in either sites. Its concludes that there is a reduction in activity of 30 percent in those places where Ivermectin is being applied. 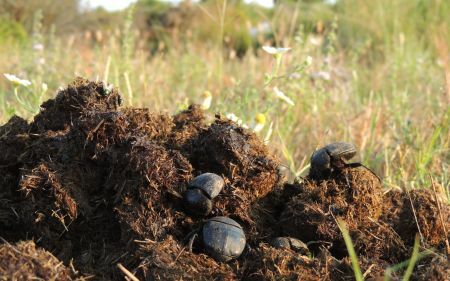 This is due to the absence of dung beetles, causing the dung to be accumulated in the field and thus, the pasture to lose quality for cattle and an irreparable loss of biodiversity in Mediterranean ecosystems, which, according to Verdú, has a dramatic environmental impact. In figures, the beneficial coprophagous wildlife populations have declined in the last 20-30 years. << The difference between ground with beetles and beetle-free ground means about 350 kilograms of dung per hectare per year which is not buried in areas affected by Ivermectin >>, the researcher said. Another consequence is the birth of very nitrophilous plants, which are not good for livestock grazing in areas where Ivermectin is found. Researchers also speculate that Ivermectin might interfere in the food chain, affecting other animals like insectivorous birds that feed on beetles. Images provided by José R. Verdú. Verdú, J.R., Cortez, V., Ortiz, A.J., González-Rodríguez, E., Martínez-Pinna, J., Lumaret, J.P., Lobo, J.M., Numa, C. & Sánchez-Piñero, F. 2015. Low doses of ivermectin cause sensory and locomotor disorders in dung beetles. Scientific Reports 5: 13912. DOI: 10.1038/srep13912.